Part 1 The nature of the problem – oral diseases and the impact of nutrition: Diseases caused by oral bacteria; Viral and fungal infections of the oral cavity; Non-infectious diseases of the oral mucosa; Dental erosion. Part 2 Food components and oral health: Nutrition and its effect on oral health and disease; Relating breath malodour to food constituents and oral health; Sugar alcohols and dental health; Dairy products and oral health; Impact of food sugars and polysaccharides on dental caries; Casein phosphopeptides in oral health; Antioxidants and periodontal disease; Anticaries and antiadhesive properties of food constituents and plant extracts and implications for oral health; Food preservatives and dental caries; Food, nutrition and oral cancer; Vitamin supplements and oral health; Trace elements and oral health; Alcohol and oral health; Malnutrition as an etiological factor in dental caries disparity; Tea as a functional food for oral health. Part 3 Technology and product development: Probiotics and oral health; Oral gum care products; Novel drug delivery systems for therapeutic intervention in the oral environment; Formulating tooth-friendly beverages, confectionery and oral care products; Functional foods and oral health. Oral diseases can have a significant impact on self esteem and quality of life, are widespread and may be expensive to treat. New methods to reduce their incidence are therefore needed and the protective effect of food constituents is an important area of study. 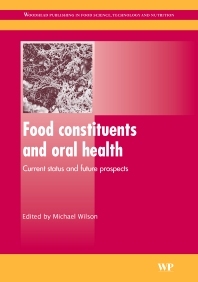 This essential collection reviews the latest research into the effects of food constituents on diseases and conditions of the mouth. Part one introduces oral conditions and diseases, with chapters on topics such as diseases caused by oral bacteria, viral and fungal infections of the oral cavity and dental erosion. Part two focuses on the effects of specific foods and food components, including sugar alcohols, casein phosphopeptides and antioxidants. The final part of the book covers the technology and development of foods and supplements for oral health and oral healthcare products containing food-derived bioactives. With its distinguished editor and international team of contributors, Food constituents and oral health is an indispensable reference for dentists, professionals in the oral health product, dietary supplement and functional foods industries and academics with an interest in oral health or functional foods. Michael Wilson is Professor of Microbiology at UCL Eastman Dental Institute, University College London and Honorary Clinical Microbiologist at the Eastman Dental Hospital, London, UK. He has published widely on antibiotic resistance, biofilms, bacterial virulence factors, and the development of new antimicrobial strategies.